My first giveaway starts today and runs through April 4th with 3 winners announced April 5th via the use of Random.org. Prizes are a blend of my jewelry Etsy shop, RockerJewlz & paper craft shop, MomsArt. 22 points possible to win fun cupcake goodies so be sure to check them ALL out. Giveaway is open worldwide to everyone who leaves their email in some form, either typed in a comment or automatically noted via your entry venue (Blogger, etc). Gotta have your email to tell you if you are a winner! 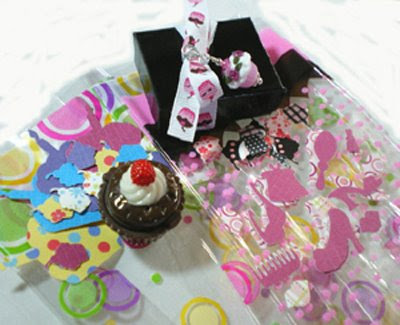 The grand prize package features a pink handcrafted lampwork glass cupcake pendant & my hand punched cupcake stickers in my most popular "Paris Chic" paper pattern. The second winning package features a cupcake pot of chocolate lip gloss and 2 sizes of my cupcake stickers in solids & patterns. And last but not least, the third prize is a fabulous set of my "Girly Girl" stickers in fun shapes like high heels, purse, comb, pair of sunglasses, mirror and lips in pink solids & patterned papers. Note for you: All your entries can be left in one comment if you like. a) WHEN YOU EMAIL ME HERE that you announced this giveaway on your own blog, including a hyperlink back to this giveaway. How to leave a comment: Click on "Comments" and it will take you to a box where you can leave a comment. If you do not have a blogger account, you may leave a comment using "Anonymous", but make sure to leave your first and last name and then click "Publish Your Comment". Have fun, and thank you for participating and good luck! This is a great giveaway Julie! Thanks!!! Yes Everyone, you can place all of your entries in one comment if you like. i voted on your poll and i'm following you. I am now following your blog! I love all of your beautiful cupcakey items, but my faves are the Fantasy Cupcake necklace, and the chocolate cupcake earrings. I was so glad to feature you in my blog last week!! love the Paris cupcake earrings & Plum Blossom lampwork necklace is Wow.. I voted in your poll! I love the Rubino Glitz Cupcake and Italian Wire Lace Ribbon Necklace at Rocker Jewelry only I would like it with a clear cupcake liner and a red cupcake! ...or the other way around! LOL! At Mom's ARt I love the Cupcake and Critter Scrapbook Embellishment Set of 8! I wouldn't change a thing! Cupcakes and critters are two of my favorite things! I voted on your poll, I am a follower and a subscriber. My favorite item is the Hibiscus Drop Lampwork Necklace. It's really beautiful and thanks a lot for this great giveaway!!! My favorite item from rockerjewlz is the Retro Black and White Lampwork earrings - love them! My favorite from the momsart store are the OOAK Paris Chic Cupcake Stickers 50 count Hand Punched, although I love the handmade cupcake stickers as well. I like the Pink Bluebells Cupcake Lampwork Earrings. Pink is my favorite color and I look so good in that shade of blue. Besides, cupcakes are so yummy! What a great giveaway Julie! Beautiful giveaway! I love the "Cherry Buttercream Cupcake lampwork earrings" in RockerJewlz and the "Paris Chic Birdie Sticker Set of 50 Handpunched" from MomsArt. I became a follower and responded to your poll. Love your art! If I could make a custom item from RockerJewlz it would be a chocolate and aqua cupcake necklace. I love everything on MomsArt, but my favorite has to be the Mod Neopolitan and Sherbet Button Set of 3. I love the colors. They would make great rings! I just subscribed to your blog & am about to do the other items. Thank you very much for this opportunity to win the cute items! I just looked at your etsy site and I love the red velvet cupcake earrings. They are so cute! I responded to your poll and am now a follower! I'm glad I found you cause your stuff is super cute! I visited both your Etsy sites and I love your pink lemonade cupcake earrings and the cupcake Heaven stickers! They are going on my birthday list! You are really talented! I like th Bonnie Blue Earrings. I also voted. Thanks for the give away. my fave items: i'm a disney FREAK, so I love your minnie & mickey lampwork earrings! mom art: the Mickfetti of course!! Gosh everyone, it is so much fun to see your comments pouring in. I'm having a blast watching this giveaway gain momentum and coming to life...weeeee! 5. 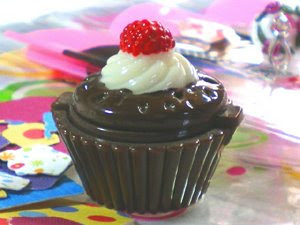 On your cupcake site: I love the chocolate cupcake bracelet!! 6. On your MomsArt site I just love the OOAK Paris Chic Cupcake Stickers! 7. I added the contest to my site and sent you an email. I'm glad I found your site, your work is amazing! Hello! I took your latest poll and I am going to e-mail you and give you my e-mail address. Cute stuff!Great give away! I love the cupcake earrings especially the Pink Lemonade ones. I have been enjoying your blog i signed up for your newsletter!! ZudaGay, thanks for the twitter. Junko, make sure that birthday list is in a REAL obvious spot! I voted for your poll, I become your new follower, and I subscribed to your blog! store! They're so gorgeous! If I were given the chance, I would like to customize the V is for...Enamel Pendant in Brown with Cream Letter V into one with my initial letter A and the necklace is to be decorated with pink and purple Swarovski crystals. How beautiful is that! Just saw you on Sandys blog, so I to want to win! Hi! I took the mini poll and responded etsy search for cupcakes since my actual method for finding your blog was not listed-I found you via the Etsy forums. SO CUTE! I have subscribed, I will be blogging about it today and I am following now too, just the cutest little things! Thanks for the opportunity! I sent you an email with the hyperlink to my blogpost about your giveaway! I responded to your poll saying I found your blog through a giveaway announcement on another blog. Thanks for hosting this giveaway! 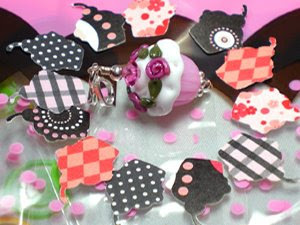 I really like the Pink Ice Glitz Cupcake and Italian Wire Lace Ribbon Necklace from your RockerJewlz shop. I would prefer a simple ribbon, but I love the pink cupcake pendant! Oh that cupcake bead is so cute. I can see it around my neck....your to sweet! I responded to your poll. My fave item from your shop is the Paris chic cupcake earrings. I LOVE Cupcakes so I am keeping my fingers and toes crossed that I win this one. What a fun and fabulous giveaway. I am absolutely in LOVE with your warm garden necklace from RockerJewlz shop. I always wear bold and unique handmade necklaces, and this one is stunning. Minnie Glam lampwork earrings, would like them more as a necklace, though. You have been blogged baby! I can't wait. I love your stuff!! I voted, suscribed and follow your blog. I visited your shop (what a wonderful work) and I love Pink Spice Cupcake Garden!!!!! I sent email for newsletter. I responded to your poll, became a follower of this blog, emailed to sign up for the newsletter & I linked to your blog and the give away on my facebook & blogger. Hoping to order a pair of your adorable cupcake earrings in the very near future. Hi! I have responded to your poll. I am subscribed to your blog by email. I am following your blog. I love your blog! It's so fun! I responded to your poll and am now subscribed to your blog. I've been perusing your Etsy site and I am in love with the Perfect Pink Tulip lampwork set. From your Mom's Art site and am really enjoying the wine bottle and champagne glass stickers. So fun! I'm excited to start getting updates from your blog, I always love finding new people to follow! Terri, glad to see you here. I need your email in case you win. I can't see subscriptions, so please email me with your email (julie@RockerJewlz.com) or place it in another comment. i voted on your poll and added your giveaway to my more giveaways page!! I voted on your poll! I responded to your poll :) *Thanks* for the giveaway! Hi. I've answered your poll and I am following you. I commented on the All things Cupcake site about my favourites which were Chocolate Aqua Cupcake Lampwork Earrings from RockerJewlz and Fabulous Pink Party Dress Button Set of 2 from MomsArt. Keeping my fingers crossed 'cause the prizes are just so cute! I voted. What a great giveaway I heart cupcakes. I just bought cupcake Converse shoes! I participated in your poll, e-mailed you, am a follower of your blog now, I adore the "R is for...Enamel Pendant in Robins Egg Blue with Cream Letter R" and the "Classic Red MickFetti and Sticker Set of 75." Amazing giveaway, but even more amazing products! Wow! Green Cupcake Confetti Lampwork Earrings and Victorian Sage Origami Lucky Star Ornament are my favs from your etsy shops. I am now a follower of your blog. The frog is me. I voted in your poll. Emailed you my addy for newsletter. Yummy cupcakes! Items look fabulous. I responded to your poll and follow. Store 1- Sterling tear drop charm earrings. so pretty! store 2 -Mod teal turquoise bottons. so cute! I just recently got hooked on cupcake jewelry and am so happy to have found your delicious site!! I happily voted on your poll and am now a happy follower. My fave item is the Pink Spice Cupcake Garden OOAK Lampwork bracelet. What I would love to see are some bag charms...perhaps a combo of the sterling teardrop heart charm earrings. The teardrop/heart can serve as the longer charm portion and then hanging off of it can be a big sparkly Deluxe Fantasy Dream Cupcake in Triple Valentine Pink! The yellow cupcake earrings, OMG sooo cute! You are amazing! My email is hollyfath@hotmail.com. Thanks! My favourite one on your MomsArt Etsy shop is this(http://www.etsy.com/view_listing.php?listing_id=14865933). Off to post an announcement on my blog about this giveaway and later,send you email about it. Wow, nearly a hundred comments and over 450 entries to date with a little over one week to go. It is so fun to see new comments every day! It is so hard to pick just one favorite item from your shops but I just love all of our cupcakes earrings and my daughter just loves the Cherry on Top cupcake lampwork earrings. Hi! I participated in your poll and I'm following your blog! Love your glass cupcake charms and stickers. I love the Valentine's Series cupcakes. Very cute and so detailed! Would love it if you checked out 2 of the cupcake bracelets on my site! I responded to your poll! My favorite thing from your RockerJewlz shop is your set of Paris Chic Cupcake lampwork earrings. Seriously, how cute are they? From Momsart, I totally love the Cinderella Party Sticker Set. Thanks so much for entries! I voted in your poll-I love the stone heart necklace. Great job with the jewelry. You left no email address for me to contact you in case of a win. I am in love with your Pink Spice Cupcake Garden Lampwork Bracelet. Absolutely stunning. I also love the Tulip Wisteria Lampwork Earrings. Lovely. I love the OOAK Paris Chic Cupcake Stickers and the Stoned Love Heart Necklace. All your stuff is great though! I made a purchase from MomsArt. I voted and i have an RSS feed go to my Google Reader (Rubymoonstone at gmail). espressogurl at hotmail dot com. Don't have a clue how many entries that gives me. From RockerJewls I like the Stoned Love Heart Necklace! From MomsArt I like the Mickfetti Mickey Confetti and Sticker Handpunched Set! I took your poll AND became a follower. Now I'm off to email you for your newsletter. Did that!!! Now I'm off to visit your stores. I love the choclate and pink cupcake earrings and the Eat Desert First Cupcake embellishments. I might just a order a couple of the embellisments. I'm off to put your giveaway on my blog. Sent you an email. That's done!!! Oh, now I get to buy something. I'll by the diecuts but I can't afford the earrings at this point. I'm bookmarking your etsy shops for later though!!! I just order something little. I'll be back another time to buy the earrings! Did that!!! I guess that's all. I think I got max points. Yay!!!! I responded to your poll, I became a follower of your blog, and I emailed you my email to receive newsletter! My favorite item from RockerJewlz shop is the Cherry Buttercream Cupcake lampwork earrings! They're so so pretty, I love them. From the MomsArt shop, my favorite item would be the Rainbow Umbrella Sticker Set of 35. I love umbrellas and those colors are just PERFECT! -LOVE your Eggy Bunny OOAK Lampwork Bracelet! stunning! -Love the Harlequin Striped Candles! So colorful! Oh and I follow you too and get your newsletter!! Thanks for the giveaway :) I voted in your poll and I would love to be subscribed to your newsletter but my email is having issues at the moment. I voted for your poll, my favorite thing in your shop are your deluxe cupcakes (snicker) and I am now a follwer of all things rockerjewlz! 2. i like the stoned heart necklace and the the blue tulip necklace the best. 3. i like the soft pastel ducks stickers. i think it would be cool if you offered a compact mirror somehow. This is a great site! My daughter loves and collects anything with cupcakes. I am now a follower and I took your poll. I like the cute bunny queen lampwork glass pendant @RockerJewlz. The Paris Chic Birdie Sticker Set @ MomsArt is adorable! I responded to you poll. Great giveaway I now follow. i like mom's bright dotted hearts! I have never saw anything like it! I like the "Cherry Buttercream Cupcake lampwork earrings" in RockerJewlz. I love the Tulip Wisteria lamp earrings! Very classy! I sent you an e-mail for your newsletter. I love the cupcakes! I really like the Chocolate Kiss Buttercream CUPCAKE Lampwork Bracelet. I love the The Bunny Queen Lampwork Glass OOAK Pendant! I like the Minnie Ears--I wouldn't make any other colors because the black makes them classy and grown up. I like the wine shapes with various designs. They could really work great for wineries/parties. Left you email with post link. I voted in your poll, I am a follower and I love the lemon tart cupcake lampwork glass earings. You are very talented. The Victorian Sage Origami Lucky Star Ornament is lovely. Newsletter and following your blog! I responded to the poll, followed the blog and e-mailed you. and i went to your shop and i loved loved loved the red velvet cupcake earrings. and can i say...you do beautiful work!!!! Ohhhh exciting....only a little over 3 hours to go...thank you to everyone for your compliments on my jewelry designing, great blog & giveaway! I'll be closing the comment section at midnight, Pacific daylight time! I love the pink cupcake lamp ornament! I like Pink Denim Bird Hand Punched Sticker Set of 30 at Moms Art. Pink Spice Cupcake Garden OOAK Lampwork Bracelet though it's way out of my price range. Winners announced by noon Pacific time Sunday April 5. Win My Fabulous Free Stuff!